Hi, hoping for some advice! My living room desperately needs updated. It is literally a big box with 19 ft high ceilings. It needs new paint, flooring, window coverings, mouldings etc etc. I like the fireplace but not the porcelain tile around it. I have no idea where to begin, other than considering lowering the fireplace, and adding a hearth. 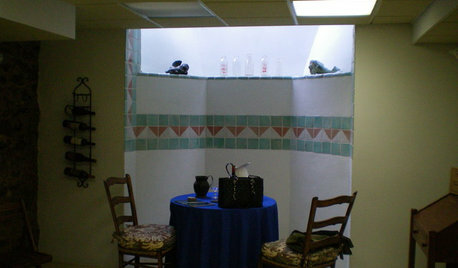 It opens onto a kitchen with a 9ft ceiling, and the hallway where the 18ft ceiling continues. Our other problem is that we have recently adopted a dog - a Great Pyrenees. He’s quite small at about Golden Retriever height, but when he barks it reverberates around the living room making a tremendous racket, which stresses him and he barks more, etc. It’s making life really tough, and although we’re working on the barking, any ideas on deadening the noise in the room would be great. Do we have to replace the carpet with deeper carpet, or can hardwood (or something else) work with decent underlay and big rugs? 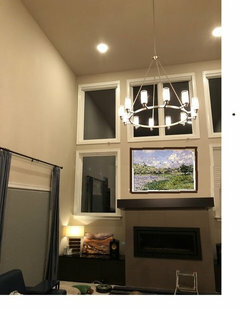 Would stacked stone on the fireplace or a wall help, and would breaking up the ceiling with faux beams or something? 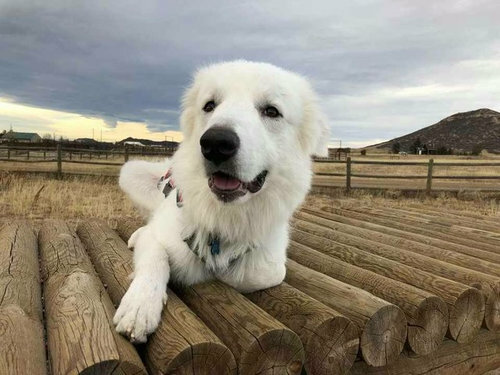 Is that the Pyrenees puppy.we have one that is 10 months old and weighs 95 lbs already. As for the space these cavernous spaces always have problems with acoustics so the more soft finishes in the space the better. I would for sure lower the mantel it make no sense where it is. With dogs I would do wood floors with large area rugs with good mats underneath. 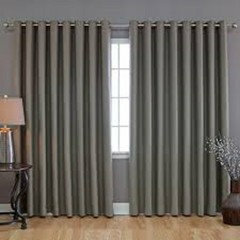 You windows need some sort of blind on the top ones and the ones beside the fireplace so mayb roman shades on the fireplace ones and motorized ones up top.I would do heavier drapes with lining and much fuller where you have the drapes now. Any thing to add soft sound absorbing material. As for the barking we have found taking him away from the windows and being very calm when telling him no barking seems to be working. They are guardian dogs and as such notice all kinds of noises and reflections so keeping the reflections to a min. has helped us.They are the sweetest natured dogs ours has been just awesome. Second, the room is beautiful. We'd suggest going up to the windows with whatever material you cover the fireplace with. 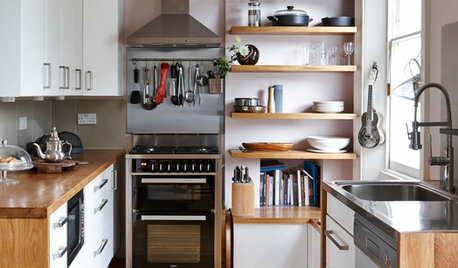 This would give the room more depth and bring it back in a little bit and warm it up. A stone veneer would be easy to install, allow for custom color, and many styles to choose from, but you have many options. What type of material do you plan on using? The vaulted ceilings are allowing "hang time' for noise (that's when a note is allowed to hang in the air...which means you can still hear it for a long long time). That's issue number 1. The second issue is the flooring. Hard surface flooring is increasing the noise that is allowed to bounce around in the space. If you think of noise as a can of marbles being dropped from shoulder height, you will understand very quickly what hard surfaces do - they allow the marbles/noise to RICOCHET! 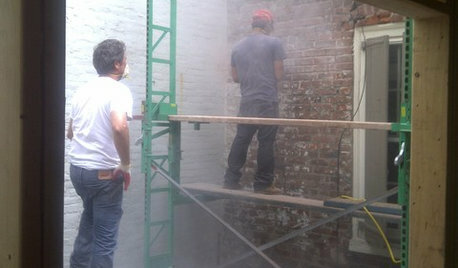 That means the ricochet is ALSO being vaulted into the air and allowed to 'hang' because of the 19ft ceilings. That means a single noise will have an ORIGINAL hang time and the RICOCHET hang time. Two noises produced by ONE event! OUCH! First and foremost: get as many area rugs down in the living space. I would like to see 70% of the visible floor covered in either area rugs or furniture or both. This is the fastest, easiest, cheapest way to do this. Now you start tweaking. The third problem you have is GLASS! Yes. Windows are reflective surfaces (bouncing marbles on GLASS = very noisy). Glass is much noisier than drywall. Those big, beautiful panes of glass on the upper wall = echo enhancers. 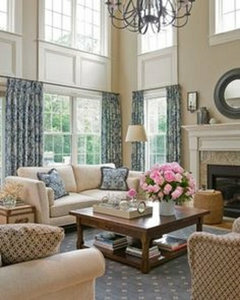 Heavy drapes (think 50-100 lbs of material) over glass is like area rugs over hardwood. In your situation this is probably not an option because those windows are very expensive and the last thing you want to do is permanently cover them with heavy felt/velvet. 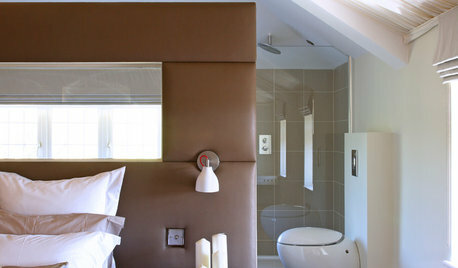 That means the next best thing: large acoustic tiles/materials mounted to the walls. These soft covered panels can be made very attractive - they become pieces of art unto themselves. They are not cheap but they are very useful. Using LARGE panels you will also create some beautiful wall decor at the same time. But they are not cheap. Magnificent....but not cheap. Looking at adding in an acoustic treatment on the ceiling would be very beneficial....and again rather expensive. You would only loose 10" - 12" in height while gaining all that noise abatement. 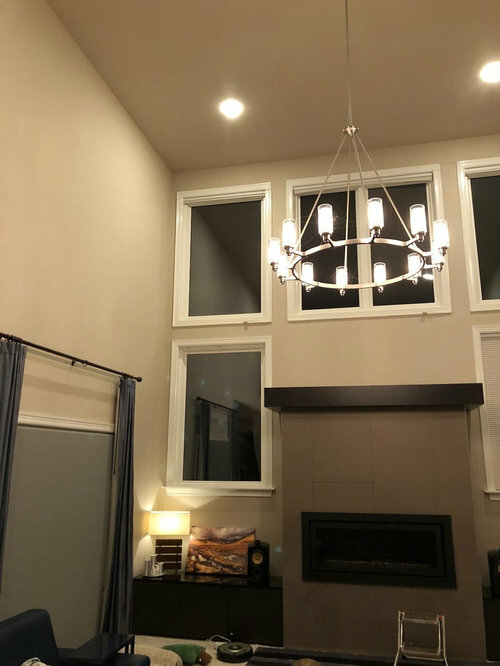 You have more than enough space up there to apply an acoustic ceiling. In total, acoustic abatement can run around $10/sf. The ceiling and the flooring will make the most amount of difference. The two put together can get you to $7/sf without much effort. Halve the room horizontally and create a second floor room. 9’ is more than enough height for human beings. Less echo. The heat won’t be at the ceiling. And you can reach the light bulbs on a standard ladder. You have a perfect opportunity for the "large acoustic materials" that SJ McCarthy suggested to fill up the expansive walls, but I would make them hanging carpets: decorative oriental type, the thicker the better. Striking aesthetics and great acoustic dampening. 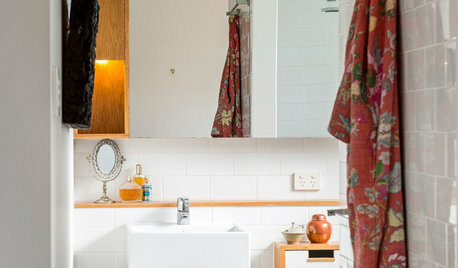 As to the light bulbs, if you'll replace them with PAR 30 LED's, you won't need that ladder for at least 22 years! 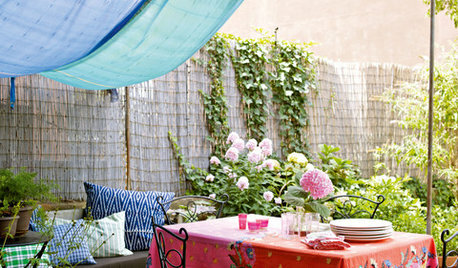 Double all the fabric panels on your drapery panels. My neighbor has two and they are big! I would not go all the way up to the window with any material for the fireplace. Bring the mantel down and maybe put in a stacked stone. Google acoustical ceiling cloud. Could work if you want modern decor. 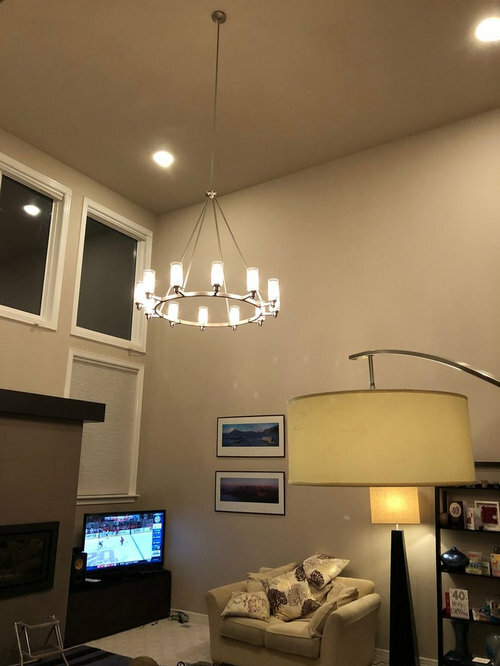 Mid century modern and antique design issues! Designing Living Room & Dining Room. Dilema #1: The Fireplace Wall. Reed Blind Natural Design, 72x84"
Reed Blind Burnt Design, 36x72"